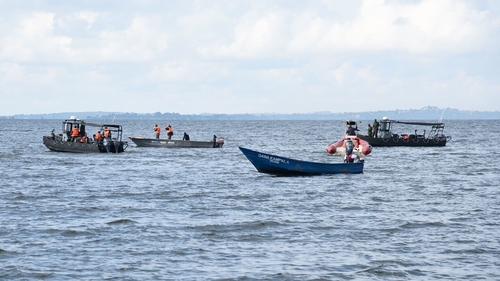 At least 29 people died when a cruise boat capsized in poor weather in Lake Victoria, Uganda yesterday, the local deputy police spokesman has said. Police had said yesterday that at least 10 people were dead following the accident off Uganda's Mukono district, close to the capital Kampala. "The boat was overloaded and secondly there was bad weather," Patrick Onyango told Reuters. The boat was carrying about 120 people instead of its capacity of just 50, Uganda's president said on Sunday. Yoweri Museveni said on his Twitter feed that the operators of the boat would be charged with criminal negligence and manslaughter. Another 26 people had been rescued from the water, police spokesman Onyango said, a lower figure than the initial 40 given by the police yesterday. He attributed the discrepancy to some survivors' failure to register with the police. Among those rescued on Saturday was Prince Daudi Kintu Wasajja, a brother of Ronald Mutebi, the king of Buganda kingdom, Uganda's largest.